Overview: Located in Shelley Beach, Wild Waves Chalets offer accommodation in self catering units. Each Unit has a patio and own braai, is fully equipped with fridge/freezer, microwave, stove, cutlery and crockery, TV with limited DSTV(bring own decoder and smart card), ceiling fans and a safe. Linen provided - bring towels and kitchen towels. Other features include a swimming pool, trampoline and jungle gym for the kids. Undercover parking. Fully walled and secure. Overview: Zest Holidays rents out first class self catering accommodation in Margate, Uvongo and the Drakensberg. These are reknown to be some of the most beautiful parts of KwaZulu Natal. Zest Holidays is committed to providing excellent service and beautiful accommodation. Clientele can be assured that their holiday accommodation in Margate, Uvongo or the Drakensberg mountains lives up to all expectations if booked through Zest Holidays. The house accommodates 6 persons comfortably. It has three bedrooms, the main with an en-suite wash room, one further bathroom and a shower room. A fully equipped kitchen and dining area equipped for 8 persons Snug with TV, DVD player and DSTV with PVR (Personal Video Recorder) Large patio area overlooking the sub tropical garden with table and chairs opens out from the living area. Overview: La Crete Sands offers Self-catering Holiday Accommodation in a secure complex with electronic gates and 24 Hour Security. 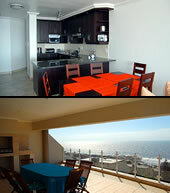 All units have three bedrooms and two bathrooms and offer beautiful views of the beach area and 180° sea views. There is a pool (safe behind gates) in the complex. The units are approximately 50 metres from the main swimming beach. Uvongo has a very scenic lagoon, with a waterfall in the background. Swimming area is safe and protected. There is also a tidal pool and children's pool available. Overview: Cosy Cabins are situated in a pretty garden on the inland side of the main road in Southport, with lovely sea views. Unit 1, a two bedroomed cottage sleeps 5 and has a small lounge, with seperate dining room, kitchen and small veranda. Unit 2 is a one bedroomed log cabin with a double bed plus a double sleeper couch in the open plan lounge/dininer/kitchen area. They are both fully equipped with TV, stove, fridge, microwave, kettle, toaster, garden furniture and umbrella etc. For nature lovers the birdlife at Cosy Cabins is great, small buck often graze right up to the fence and monkeys come into the garden to steal from the fruit trees. 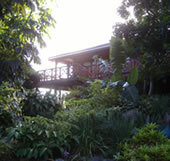 Overview: Emerald Cove offers luxury self catering accomodation in cosy thatched chalets located right on the beach. Each cottage has 1 or 2 rooms, a lounge, kitchenette and private patio and is equipped with a microwave, fan and TV. (DSTV available - bring your own decoder). Facilities include a swimming pool and braai area. Walking distance to popular St. Michaels beach and numerous activities of interest in close vicinity. Overview: Located 80 meters from the beach; Pinnacles is an incredibly spacious fully equipped self-catering unit. Sleeping four, the unit comprises two bedrooms ( 1 x DBL and 1 x 2 single beds), lounge, kitchen and separate bathroom and toilet facilities. Private entrance and covered patio. The kitchen has a full stove, double door fridge/freezer and microwave oven. The lounge has a TV, Hi-Fi and DVD player and the unit is wired for DSTV- just bring your own decoder and smart card. Easily accessible from the motorway and located close by to all the necessary shopping amenities. Nearby attractions within easy driving distances. Overview: Anchorage offers holiday accommodation in the fully equipped, upmarket self catering house/cottages and is located in Margate. There is a swimming pool, baby pool, jungle gym and bunny hutch. Each have their own private garden and braai area. Ample, secure undercover parking is available. Very reasonable rates. Overview: Black Forest Holiday Apartments offer self catering accomodation in Uvongo. Being situated just a 'stones throw' from the blue flag Uvongo main beach as well as various attractions and ammenities, these are the ideal holiday retreats. Each apartment (6 sleeper) comprises 2 bedrooms, 2 bathrooms, open plan kitchen, dining room, lounge and balcony overlooking the swimming pool and garden. 3 bedroom (8 sleeper) units available. All apartments are fully equipped including TV, fridge, microwave, kettle, toaster, iron, catering equipment and crockery. Linen is supplied (towels not incl.). A DSTV connection is available, bring your own decoder. Overview: Located in Shelley Beach, Ristany's offers guests luxury fully equipped and self catering accommodation with a choice of One, Two or Three Bedroom Units. (Linen included in all Units with towels and toiletries an optional extra). Each Unit has its own braai and is equipped with microwave, stove, fridge, TV, Shower, wash hand basin and toilet. Our own fully licensed restaurant and pub onsite. We cater for conferences. Overview: Ocean View Beach House in Palm Beach invite you to come explore the South Coast and the Zulu Kingdom. Visit 'Palm Beach' with its beautiful beaches on the warm Indian Ocean right in front of the house. Come enjoy a great game of golf, as we are situated in a prime golfing destination close to six top quality golf courses in South Africa. Bring your family and enjoy a warm holiday in a modern, secure privately owned house, surrounded by a beautiful garden with a sea view. Ideal for groups of maximum 8 people ... Und ... "Wir sprechen Deutsch". Overview: Upmarket duplex on Margate beachfront. 3 bedrooms, 2 bathrooms. Open plan lounge, dining room and very well equipped kitchen. Beautifully deocoratd by individual owners. Large verandah with braai. Stunning sea views. Pool in complex. DSTV and daily servicing included. Secure complex - fully fenced with automatic gates. Centrally situated - 50 metres from the beach. Within walking distance of shops, restaurants etc. Close to outstanding golf courses in the area. Other activities include fishing, surfing, whale watching, air and microlight flips and much more. Overview: Whether on holiday or business, Flamboyant offers the ideal environment to unwind and experience a wonderful time. This 4 star graded establishment is ideal for guests looking for top class accommodation. Flamboyant is serviced daily: we will wash your supper dishes of the previous evening with your breakfast dishes every morning, make your beds and give the house a general cleaning. This fashionable, spacious and private log house was designed and built by one of the leaders in the luxury log home industry. It is high up in the air with three bedrooms and two bathrooms. The deck has a kettle barbeque and is furnished for some REAL outdoor eating and drinking, especially on those balmy summer nights! SORRY NO SMOKING INSIDE due to the nature of the house. Flamboyant consists of 3 bedrooms, a fully equipped kitchen (microwave, nice size fridge/freezer, a stainless steel stove etc. ), two bathrooms, lounge and dining room. The open plan kitchen/living area has air conditioning, satellite TV (DStv) and spills out onto the deck. There is secure open parking under the house. There is also a lockup garage if your vehicle's maximum height is not more than 1.93 meters. You will be given a remote control for the gate to enable you to come and go whenever you want to. The swimming pool on the premises is exclusively for our guests to use. The wonderful stretches of the three warm water beaches surrounding Southbroom are just 1.7km away! Linen and bath towels are provided on a regular basis. Just bring your own towels for swimming. Our service, the exclusivity and privacy of this accommodation are real special features. We look forward to welcoming you!